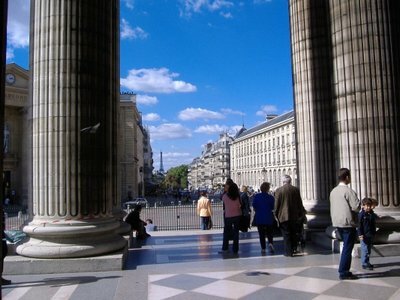 This week finds me in the Pantheon, where the great men (and women) of France are interned. More dead folks. That is three weekends in a row of the dead. The Pantheon is quite nice, but very sterile. I much preferred the chaos and colour of Pere Lachaise to the somber sternness of the Pantheon. I also like that Pere Lachaise includes people, like Oscar Wilde and Jim Morrison, from other lands. I find the concept of being buried in some foreign cemetery quite romantic. I do hope that when I die, it is on foreign soil. And instead of bringing me back home to Canada, who ever is in charge of seeing me buried does it wherever I fell.